It is common for a homeowner to have questions about their windows and whether or not it is time to replace them, but to not know who to go to for answers. The good news is that Charles Window is here to answer those questions. Read on for a few answers and then reach out to us for answers to your other questions or to schedule a free in-home consultation. How can I clean up scuffs on my vinyl window frames? Vinyl windows are resistant and easy to clean. They also last for decades, don’t dent, and don’t scratch. They don’t bend, they don’t warp – they are a great option overall. That said, they can scuff. The good news is that cleaning this up is as easy as grabbing a soft cloth, wetting it with a mix of water and mild soap, and wiping them down. Just be sure not to use any type of cleaner that is harsh and / or abrasive. What happens if there are cracks in my windows? You will need to contact a window repair company. In some cases, it may be possible to fix the crack with a glass repair. However, it is more likely that you will need to replace the entire window – it all depends on how serious the crack is and how deeply it runs into the frame. Regardless of how serious it is, a cracked window should never be ignored. It can let in bugs, can affect your home’s energy efficiency, and is essentially guaranteed to get worse if left alone. Is it necessary to replace all my windows at the same time? No. Though we work to provide the most affordable prices possible for windows and window installation, and we offer access to rebates, financing, and other options, we do know that windows are quite an investment. They are an investment that pays off, but they still require upfront capital. 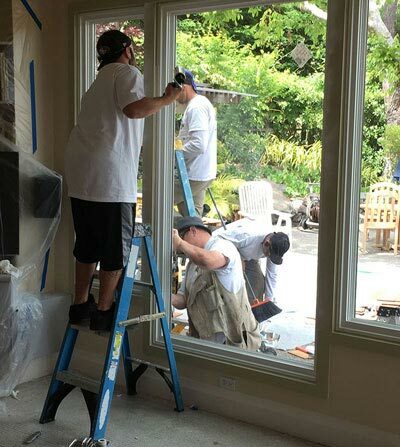 For this reason, it is not uncommon for a homeowner to choose to replace the windows in one room at a time as they get the funds to do so. If you are wondering if now is the time to replace your windows then we recommend you reach out to Charles Window for a free in-home consultation. We can come out to you, take a look at your current windows, listen to your needs, and provide an honest assessment of your best way forward.